The US government is to launch a revolutionary new light bulb which is the most energy-efficient yet and lasts for 20 years. There's only one snag. It costs $60. 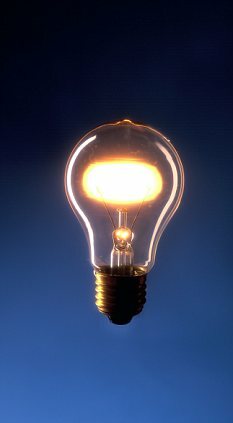 The bulb was developed after Congress launched the the $10-million L Prize competition in 2007 to find a bulb to replace the energy-wasting 'incandescent' 60-watt bulb. But when only Dutch manufacturer Philips entered the contest, it was declared the winner and began work straight away. The bulb, which is is supposed to give off a pleasing, natural-looking light, will go on sale at Home Depot and other outlets starting on Sunday - Earth Day. Its $60 price reflects the cost of the components, especially the top-notch chips, or diodes, that give off the light, and is the price commercial customers will pay. But Philips is discounting it right away to $50 for consumers, and working on deals with electric utilities to discount it even further, by as much as $20 to $30. This means the bulb will cost anywhere from $20 to $60, depending on where it's found. Online, consumers will be paying $50 for each bulb, because utilities don't subsidize online sales. Congress launched the L Prize contest in 2007, with the goal of creating a bulb to replace the standard, energy-wasting 'incandescent' 60-watt bulb. The requirements were rigorous, and Philips was the only entrant. Its bulb was declared the winner last year, after a year and a half of testing. The contest stipulated that the winning bulb be sold for $22 in its first year on the market. In that context, the $60 price tag has raised some eyebrows. Ed Crawford, the head of Philips' U.S. lighting division, said it was always part of the plan to have utility rebates bring the price down to the $22 range. Utilities already offer rebates on energy-saving products such as compact-fluorescent bulbs, or CFLs. In return for efforts to curb energy use, regulators allow utilities to raise their rates. The discounts are invisible to consumers - the utilities pay the stores directly. For $25, or even $35, the bulb looks like a good investment compared to an incandescent bulb. It uses only 10 watts of power, meaning saves about $8 per year in electricity if it's used four hours a day. It's expected to last at least 30,000 hours, or 30 times longer than an incandescent. At four hours per day, that's 20 years. But the Philips bulb is not only up against $1 incandescent bulbs. CFL are nearly as energy efficient. They use about 15 watts for 60 watts worth of light. They're much cheaper too, typically costing around $5. The Philips bulb looks odd too -the light-emitting surfaces are yellow when the bulb isn't lit, yet shine white when it is. 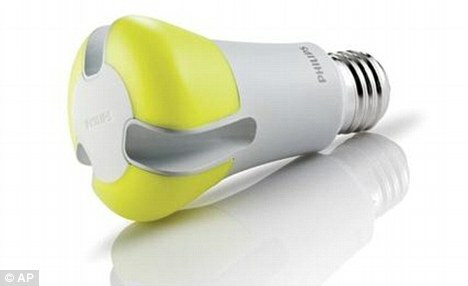 The Philips bulb has some advantages over a CFL: It lasts three times longer and gives off a more natural-looking light. It doesn't contain the toxic mercury vapor inside CFLs, which creates a minor hazard when they break.